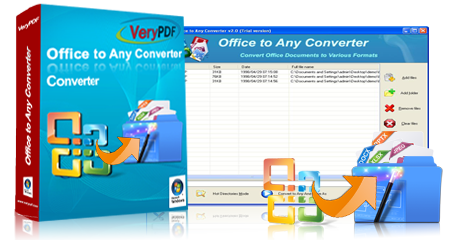 Office to Any Converter can be used to convert documents to PDF files. For example, if you want to convert Word to PDF, just some easy clicks, Office to Any Converter will do it for you perfectly. Please see Figure1, it is the window snap shot of Office to Any Converter. There is a table taking up the most of interface used to list all the waiting Office files. There are several available buttons on the right, like button "Add files" for adding the Office files needed converting. You can also drag the Office files into the table list. "Add folder" button is used to add all Office documents saved in a same folder to the table at one time. "Remove files" button is for deleting file from the table one by one and the button "Clear files" is used to remove all the files added in the table. If you want to buy the application, please click "Purchase" button. After adding files into the application, please click the "Setting" button below the file table and you will see a popup window named as "Option" which contains a Tab control with many Tabs. Please see the window in Figure2. There are two option boxes, three check boxes and one combo box in the "Basic Setting" sub tab. If you have MS Office installed in your computer, please choose "Use MS Office for conversion" option box. Or else choose "Don't use MS Office for conversion" because the application supports the conversion from Office to Any without MS Office installed. Then you can check any check box according to your needs. In "Convert to" combo box, please choose ".PDF" option if you want to convert Word to PDF document. You can also set other parameters for the converted PDF document, such as encrypting the PDF document, setting PDF page number, adding PDF watermark, editing the PDF description, etc. in other Tabs. When everything has been done, click "OK" button and you will back to the window of Office to Any Converter again. Click the button "Convert to Any and Save As" to open "Browse for folder" window to specify the location for the converted files. Then click "OK" button then you will see the conversion process according to the progress bar at the bottom of Office to Any Converter window. When the conversion from Word to PDF is over, you can choose whether to open the output directory or not in the small popup window. If you want to browse the target files after conversion, you should click "Yes". Learn more to convert Office (Word, PowerPoint and Excel) to image (JPG, PNG and BMP).